Who were the original inhabitants of Melbourne? A free one hour guided walking tour through this formal garden highlighting its rich history. Bookings are not required. The tour leaves from the Information Centre in the gardens. Garden lovers can enjoy a free tour of the Government House gardens. Tours start at 11am and are free but bookings are essential. The gardens feature magnificent lawns, specimen trees surrounded by large beds of trees and shrubs, and the Peace and Prosperity Kitchen Garden. The gardens also feature ceremonial trees planted by members of the Royal Family and previous Governors. The tour goes for about one hour and you will need a general level of fitness. There are some steps, small hills and uneven surfaces. While each tour caters for up to 30 people, there are no group bookings available. Wear casual clothes with sensible footwear. Bring photo ID (passport, drivers licence, student ID etc.,). Check in at the Government House Gatehouse 15 minutes before the tour starts. Entry will involve passing through a security checkpoint and bag inspection. You are encouraged to take public transport: Flinders Street Station is a 15 to 20-minute walk to Government House Take the St Kilda Rd/Coventry St tram - routes 3/3a, 5, 6,16, 64, 67 and 72 - and get off at the Grant Street - Police Memorial stop. Parking is not available at the House. If you drive, there is metered parking on Linlithgow and Birdwood avenues. Tours can be cancelled in extreme weather or for operational reasons. White Hat can recommend the Port Open Day Tours to anyone interested in the functioning of the Port of Melbourne as well as to those interested in Melbourne's history. In the early days of European settlement, shipping came right into the current CBD near Flinders and William Streets. Over time, ships became larger Victoria Dock was dug out of the swampy land behind Batman's Hill and low bridges blocked access to all but smaller boats. Further major works saw the creation of Swanson Dock and a man-made channel was dug to accommodate the larger shipping and eventually container vessels. The lower Yarra River that was known to Aboriginal people was filled in and is now covered with housing and factories while the man-made channel south of the city is what we think of as the lower Yarra river. Port Open Day boat tours are fun, family-friendly events and one of the best ways to see Australia’s busiest port, right on the city’s doorstep. Featuring a guided commentary from port staff, you’ll see the port from a whole new angle. 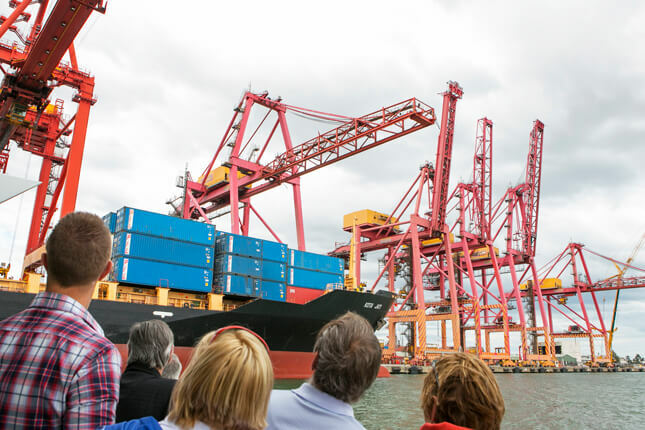 Tours depart from Victoria Harbour in Docklands, and include Victoria Dock and Appleton Dock, the port’s more historic facilities, before visiting the container terminals at Swanson Dock. PLEASE NOTE: While every effort will be made to adhere to advertised tour routes, these may be changed without notice due to vessel traffic considerations on a given tour day. Once bookings are open for a particular date you can book online here. Bookings cannot be made prior to booking opening date and all bookings must be made in advance. Payment on the day is not possible. We will remind subscribers to the White Hat Melbourne Newsletter when bookings open for each tour. Melbourne Cemetery is an ideal introduction to Melbourne's history - particularly with the entertaining and informative guide from White Hat. The final resting place of many famous Australians including Peter Lalor, judge Redmond Barry, Sir Robert Menzies, John Gorton, Marcus Clarke, Burke & Wills, Sir Isaac Isaacs, Walter Lindrum and many more. As chosen and recommended by the Qantas In Flight magazine in May 2007. More information on the cemetery tour >>. ..
$15 per head .. 1pm to 3pm, selected Sundays ..
Visitiors to the monthly meeting will enjoy a guest speaker, after which a light supper is served. ..